Caesalpinia is a genus of flowering plants in the Legume family. The species range in size from medium shrubs to small trees. They make the landscape come alive with color. Their large bright flowers provide vibrant color for long periods of time. The shades of yellow, fiery red, and orange contrast with the feathery foliage. The generic name honors the botanist, physician and philosopher Andrea Cesalpino (1519–1603). Caesalpinia requires bright illumination, no less than 8 hours of direct light per day. However, on the southern side, the plant may suffer from heat, so shading is required. Suitable for western and eastern windows. With a lack of light, it is very difficult to achieve flowering. Too fertile substrate is not necessary. A simple mixture of leaf and sod land with the addition of sand is suitable. Preferably loose soil can be used for commerce on the basis of peat mixture with the addition of perlite or vermiculite with a neutral acidity (pH 6.5 to 7.5). Good drainage and a hole in the pot are needed. 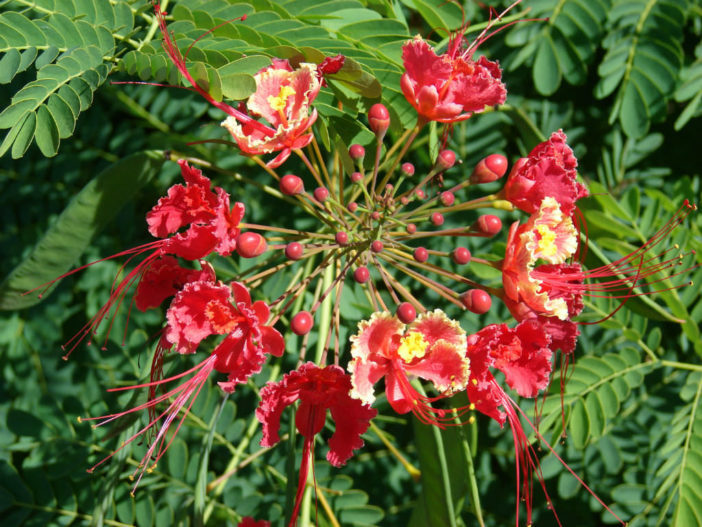 Caesalpinia requires regular, abundant watering, approximately 1 to 2 times a week in the summer. In winter, the plant is humidified less often. The soil between watering should be slightly dry. It is better to provide a rare, but abundant watering, in comparison with frequent, but small portions. Abundant watering stimulates the development of a deep root system. The plant tolerates drought quite easily, but the substrate must not dry completely, especially for young shoots. With insufficient watering, the formation of flowers is difficult. The plant is fed approximately once every 2 weeks, from spring to autumn. In early spring nitrogen should prevail in the period of growth in fertilizers. In the future, for better flowering, use top dressing with a high content of phosphorus and potassium. As the flowers wither, they must be removed. In spring, pruning is necessary, but flowers develop on the shoots of the current year, so if the crop is cut off late enough, it will not bloom at all. In the summer it is very useful to take the plant on a balcony or in the garden. The plant has an interesting feature to fold the leaves at night. Some species are successfully grown in bonsai culture and look very impressive. Caesalpinia can be propagated by semi-woody cuttings, which are rooted in a mixture of peat and sand, covered with a plastic bag. However, the soft green non-fading cuttings can be rotten. Caesalpinia is sufficiently resistant to pests. It is affected most often by a spider mite. The lack of flowering can be associated with insufficient lighting, which can also lead to strong stretching of shoots.